How often are you in your sanctuary, in the presence of the sacred cross? For most of us, we probably worship in the sanctuary once or twice a week, but do our ministry elsewhere. We are on the go, ministering here and there, in classrooms and homes, at camps and hotels, beyond our neighborhoods and even our country. Carry Your Cross Ministries has created the ultimate ministry tool - a handmade, folding cross packed in a durable bag for portability. 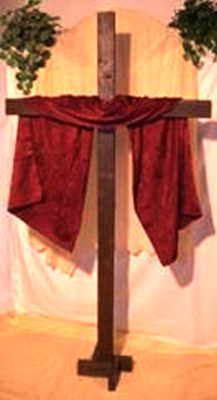 This custom-designed, six-foot "Travel Cross" is a must for every retreat and conference. Extends to 80" and folds to a compact 40"